The opening scene shows a truck being chased by the police, driving in to a car park. The driver and passenger abandon the vehicle and then shoot the equipment in the back to trigger an explosion. Sam and Callen are seen calmly walking away. Post opening credits, the team are in the boatshed, five hours earlier, wrapping up a case where Kensi has played the part of femme fatale to entrap a billionaire, funding domestic terrorism. The interrogation room seems unusually dark, as does the rear of the boatshed, where Sam and Callen are left standing after the villain is escorted out. By contrast, Kensi and Deeks are shown in a warmer light. It’s a reminder they have been working all night, as well as signifying the ‘Densi’ relationship is still blossoming. Kensi plays down the fact her mark was a billionaire, preferring “things with flaws”. 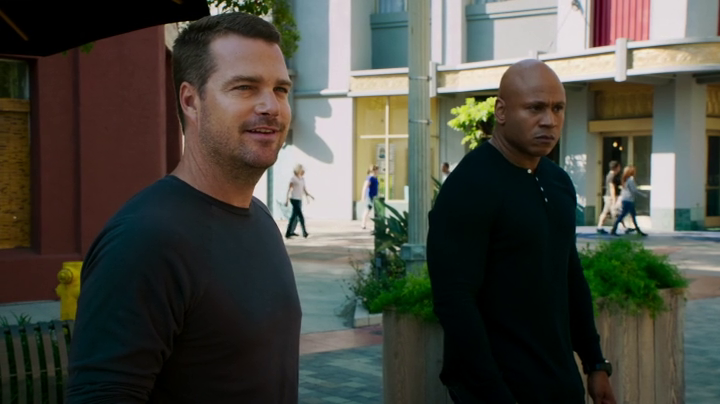 Callen response that it’s no secret – looking at Deeks – demonstrates the rest of the team are now comfortable with the Kensi / Deeks relationship. In another change to the norm, the team are given the day off and there is a rare opportunity to observe them outside of work. Sam and Callen are winding down with healthy shakes and snacks at an outside restaurant. The usual banter from Callen about foods and LA fads ensue until their peace is disturbed by a cyclist dropping a phone on their table. It turns out the guy on the other end knows their identities, is observing them and threatens to blow up twenty people if they don’t follow his exact instructions. The episode almost parodies itself when the unseen villain suggests Sam and Callen should have a theme song for their heroics. To demonstrate his point, the pair have just enough time to save everyone before a bus shelter explodes. The action is then punctuated with a slow domestic scene; Kensi and Deeks are shown having breakfast and talking about their feelings. Deeks’ insecurities come to the fore, as he’s worried he can’t give Kensi the gifts and life style she’s experienced in her recent undercover role, or that he believes she deserves. Kensi’s honesty about money and her own feelings show just how far both have developed since season five, and their talk demonstrates how secure their relationship now is. Meanwhile, the villain has Sam and Callen running all round LA, and the bad guy is revealed early as he meets them in a children’s playground. (Five shifty looking men in a crowded playground and not one parent thought to call the police?) When Kensi and Deeks finally track their movements, the action yet again slows down with another domestic-type scene. Thankfully there is not a conversation about babies, but Deeks’ amusing hair-brained scheme about property development, leading the viewer to question how he has a new large house yet still has savings to invest. Nell also ventures out in the field to accompany Granger. In a similar way to how Deeks and Kensi changed their clothes before heading back to work, Nell ties her hair back for her adventure into the field…maybe a confidence booster as she babbles to Granger. Yet again Granger has the best line of the episode when Nell asks if there is a Mr Miagi mentor thing going on. Eric however, thought he could accompany Granger and was earlier shown scrabbling along the floor to practice self defence moves. He is not a field agent – why did he think he could go with Granger? Goofy Eric is back and it is uncomfortable to see. The villain is identified as Chad Brunson, crazy older brother of the crazy Tyler Brunson who Sam killed in season five (Three Hearts), which also featured rogue undercover NCIS Agent Paul Angelo. The question remains as to who sold out the partners to Brunson (he conveniently died before he could tell). This is also a throwback to NCISLA season one episode Burned, where Callen’s true identity was revealed and compromised. Then, he was kept out in the cold until the threat cleared. Even though someone else has now burned both Sam and Callen, they are allowed to continue in their roles. The final scene between Granger, Hetty and the burned partners, discuss the mole from season six, another storyline that was never resolved, just apparently forgotten. NCIS still do not know for whom he was working. And interestingly, Hetty refuses to allow anyone to speak with Paul Angelo; she is handling him on her own. So far all four episodes have re-introduced characters previously seen, with another possible link when a dying Brunson said “checkmate” to Callen. Is this a throwback to Callen’s nemesis Janvier, setting up a long game from his solitary prison cell? Season seven is going to be jam packed with tidying up the loose ends of plots, or a number of threads will tie together for one or two story arcs. Will there be anything left to develop for season eight (if there is one)? Overall it was a fun filler episode that sits well with season seven so far, but is just seemed to lack that little something that would have made the 150th episode special.